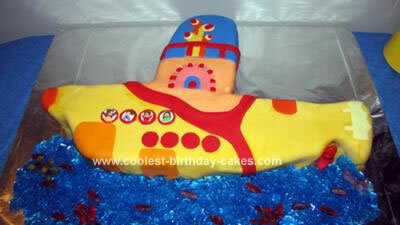 My sister made me this Yellow Submarine Cake for a Beatles Birthday Bash I had. It took her 4 days to make. First she made the Beatles in each porthole out of fondant. She dyed all the fondant herself with gel food dye. She made three pans for the cake, a front section, a middle section and the back. She made the molds out of disposable pan tins you get at the grocery store and painters tape, she then lined the pans with tinfoil so they didn’t leak. I wanted a Tye dye cake inside. So she dyed 5 different bowls of batter each a different color then poured them in layers in the homemade molds. She ended up using 6 boxes of cake mix and it took 4 hours to bake. After they cooled she removed them from the pans and placed the 3 sections together and iced them. She then rolled the yellow fondant over the cake. The propeller was her biggest challenge because she wanted it to move but after 3 hours of trying to get it to spin it ended up being stationary. There was a nail holding it in place. She enlarged a picture of the submarine so that she could make sure everything was in proportion then cut out pieced of fondant and lined everything up. She used jello to make the water and even included some octopus and fish in the sea. It was the best cake I have ever had! This is the most amazing cake I have ever seen! All the outside detail is outstanding, not to mention the tie-dye cake inside. I’m saving this page to favorites for my son’s birthday next year. Your sister is seriously talented! love the idea of using a tie died batter. the cake looks fantastic, well done! !